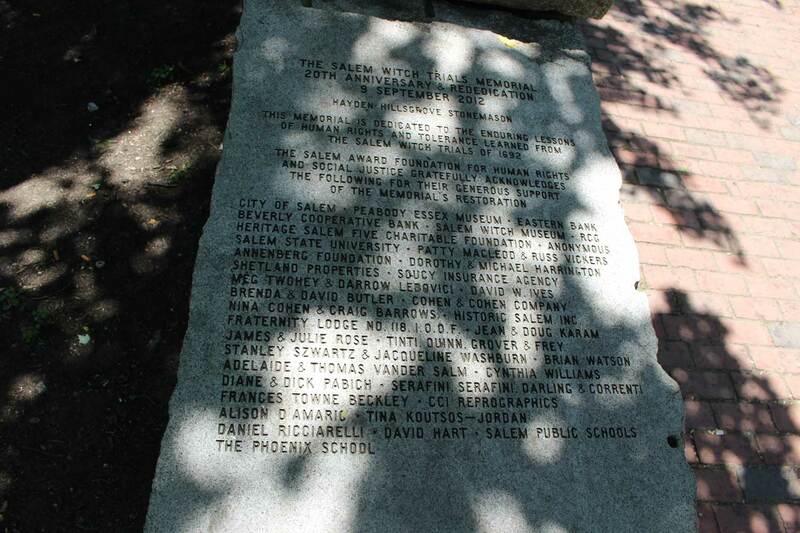 Located just off Charter Street, on Liberty Street, is Salem’s simple yet dramatic memorial to the 20 victims of the witch trials of 1692. 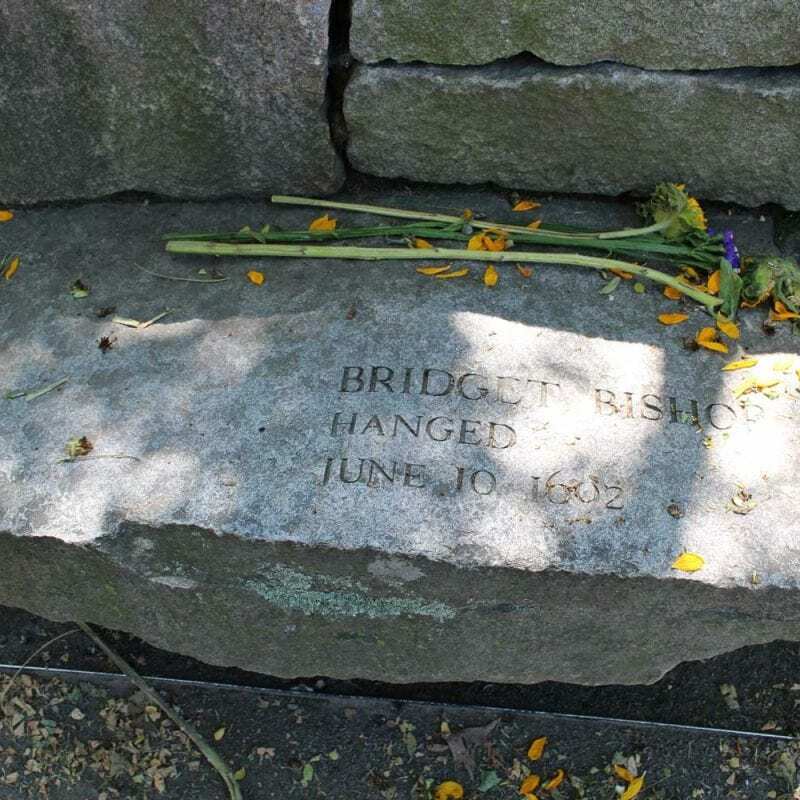 Four foot high granite walls surround three sides, with granite benches representing each victim cantilevered inward from the wall. 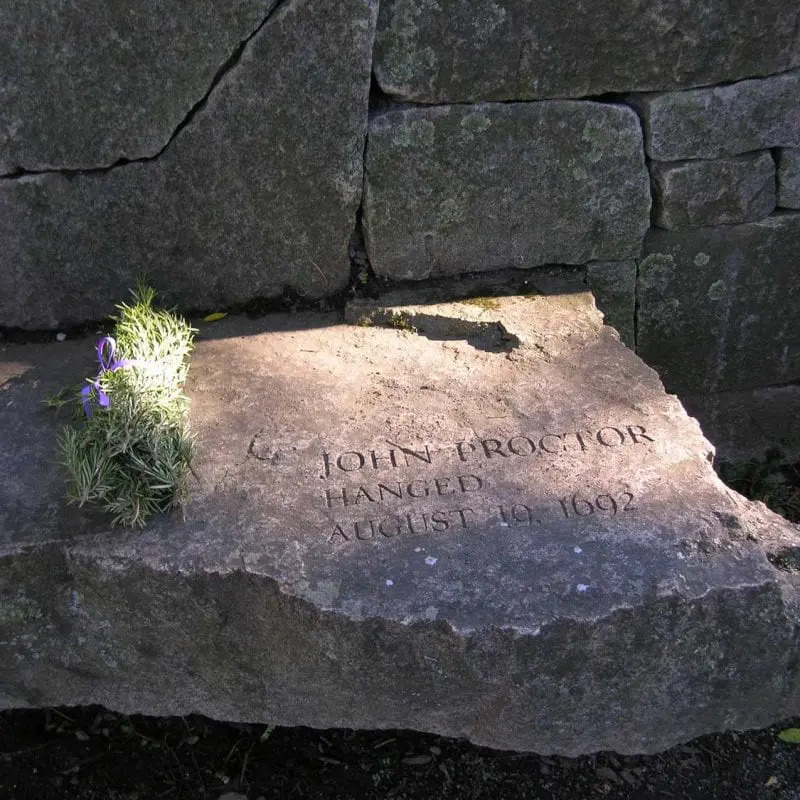 Etched on each bench is a name, means of execution, and execution date. 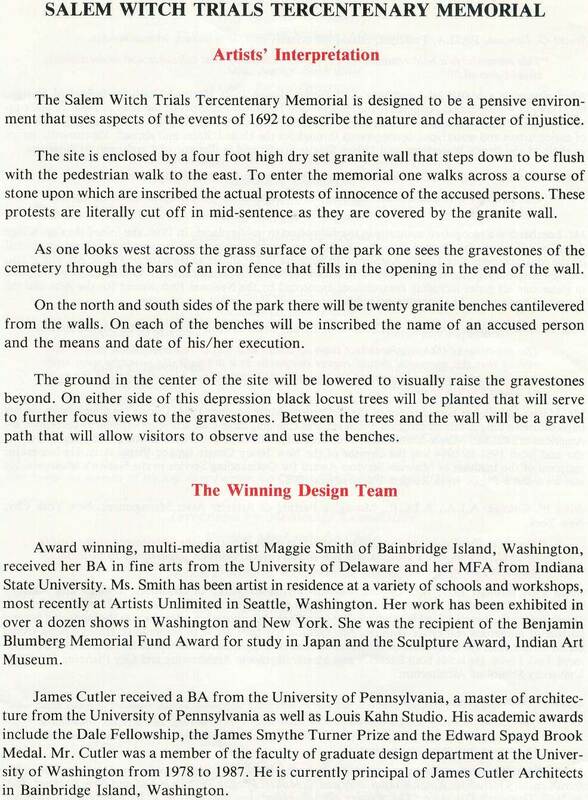 One can read, on the stone threshold of the memorial, words of the accused taken directly from court transcripts. 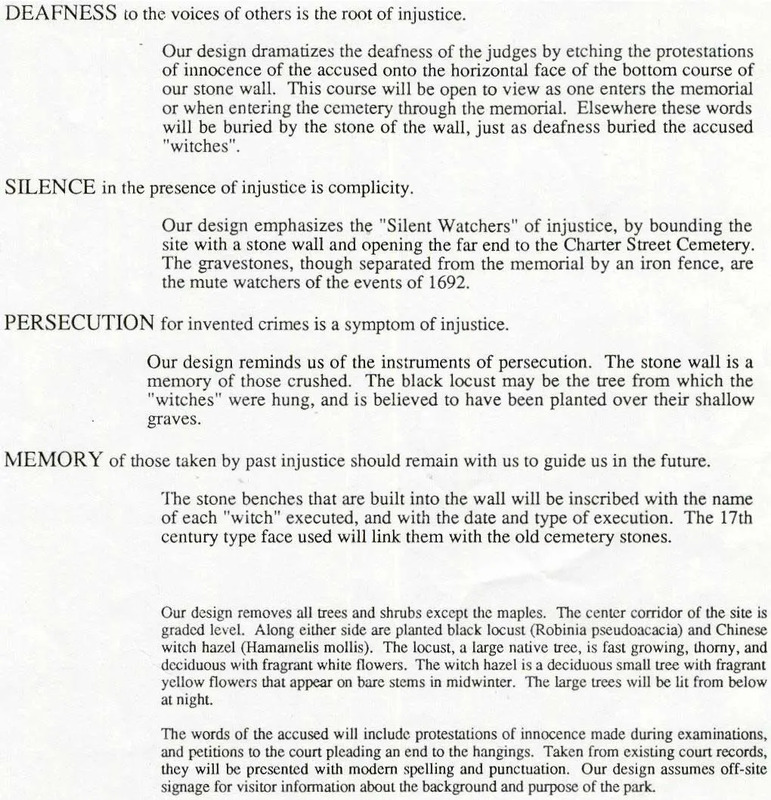 Visitors will note that the words – among them, “God knows I am innocent” – are cut off in mid-sentence, representing lives cut short and indifference to the protestations of innocence. 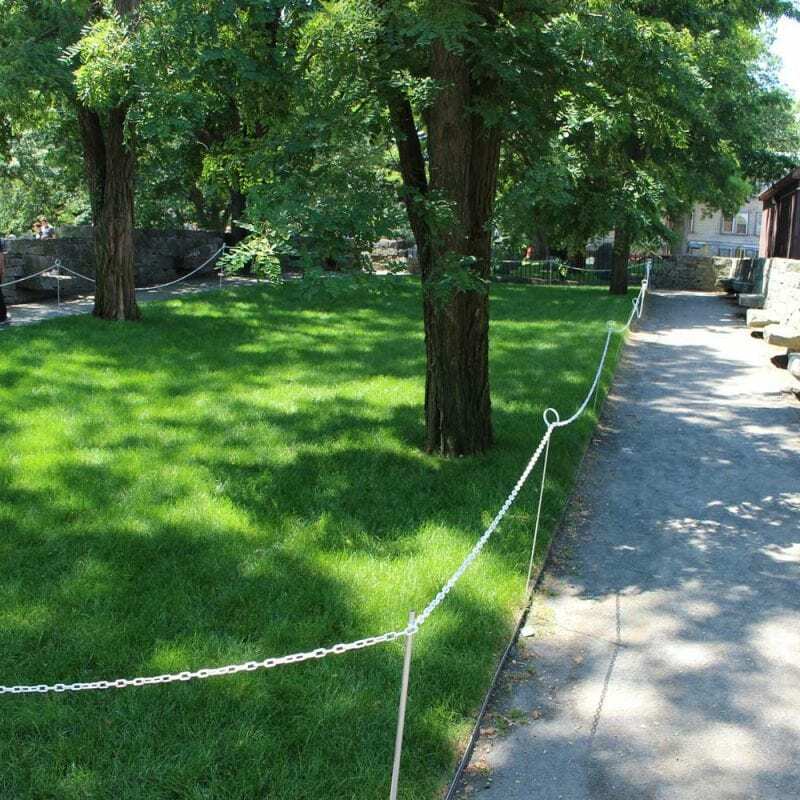 In the center is a simple patch of grass and locust trees, which are thought to be the type of tree that may have been used for the hangings. 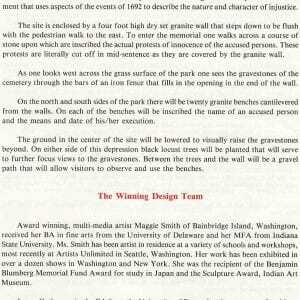 A dirt path runs beside the benches for visitors to walk and reflect. 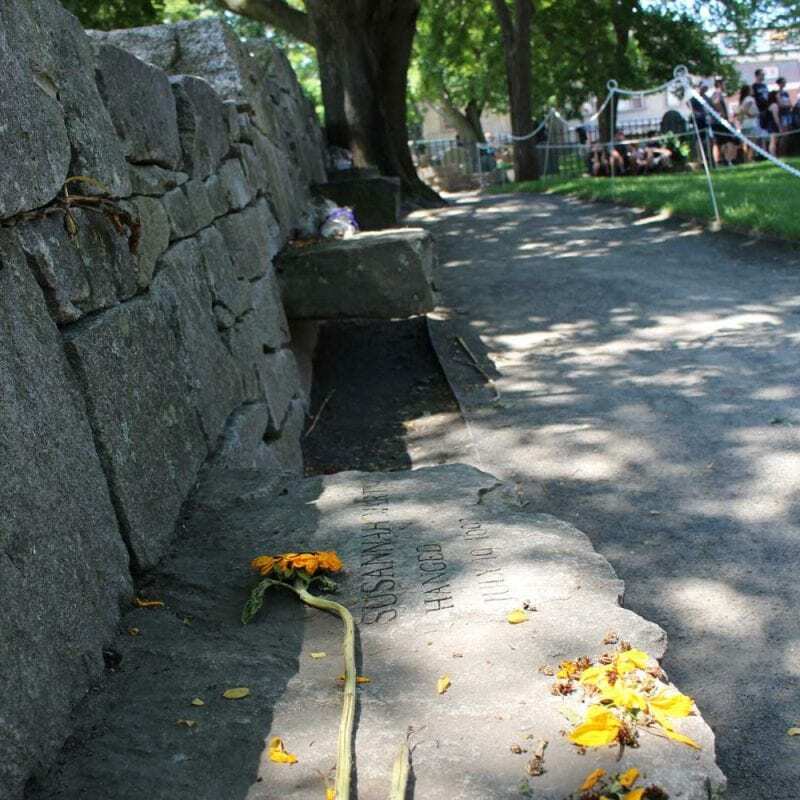 Silently watching from just over the wall are the gravestones in the adjacent Old Burying Point Cemetery, the oldest cemetery in Salem and one of the oldest in the United States. 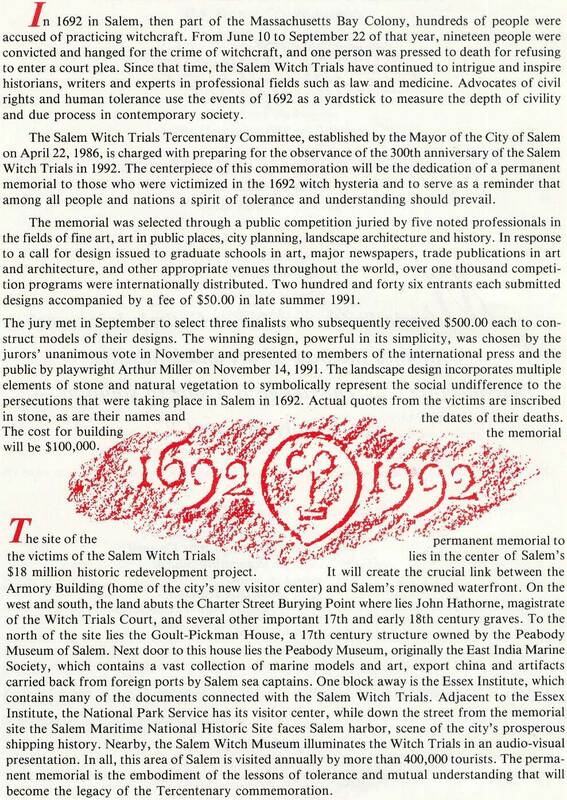 Among the interred are witch trials magistrates John Hathorne and Bartholomew Gedney. 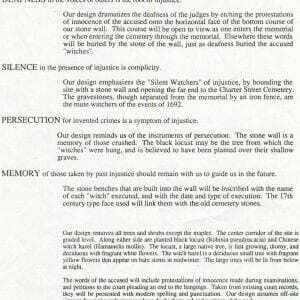 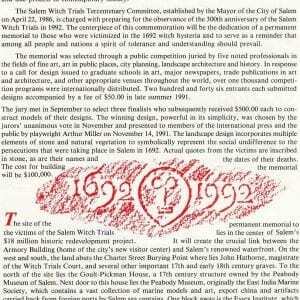 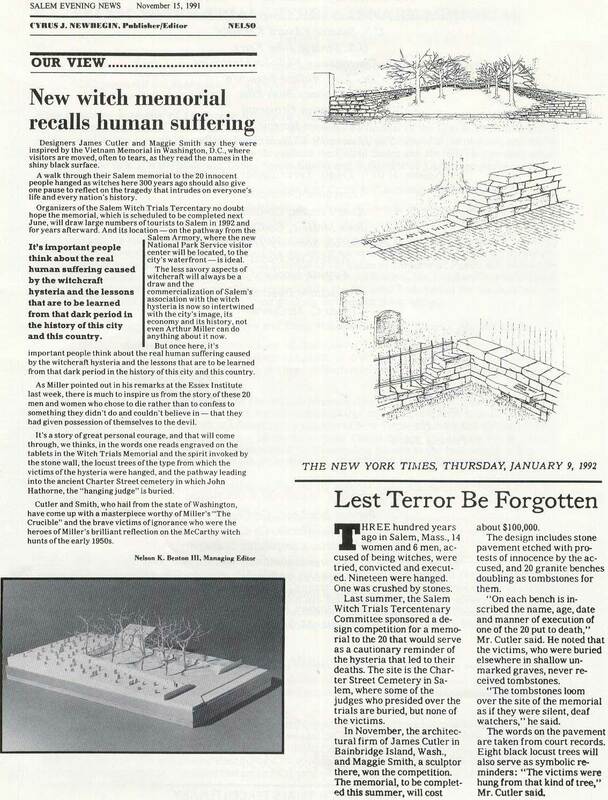 The Salem Witch Trials Tercentenary Committee was established by the Mayor of the City of Salem on April 22, 1986, with a principle intention of creating a permanent memorial to the victims of the witch trials. 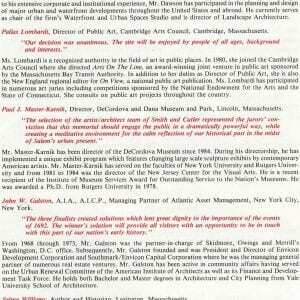 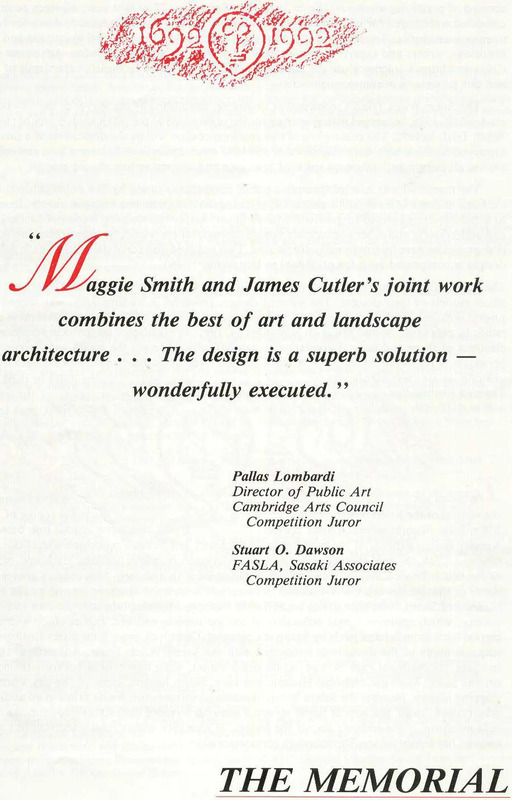 A public design competition, juried by five noted professionals, resulted in 246 entrants. 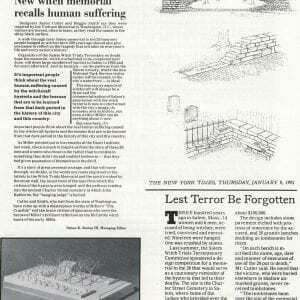 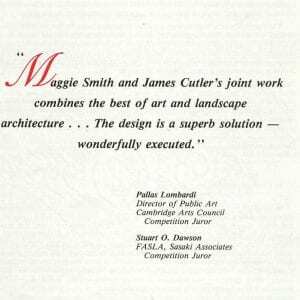 The winning entry, designed by Maggie Smith and James Cutler of Bainbridge Island, Washington, was presented to the press and public by renowned playwright Arthur Miller on November 14, 1991. 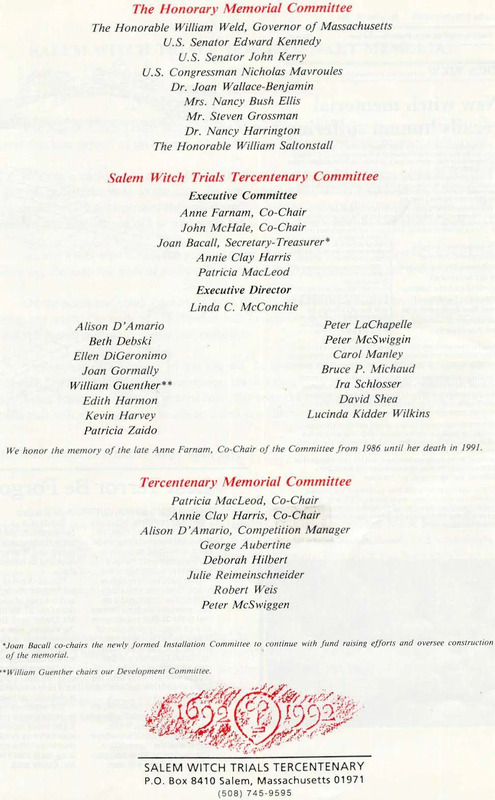 Among the notable works by Miller is The Crucible, which used the Salem Witch Trials as an allegory for the McCarthyism of the late 1940s and early 1950s. 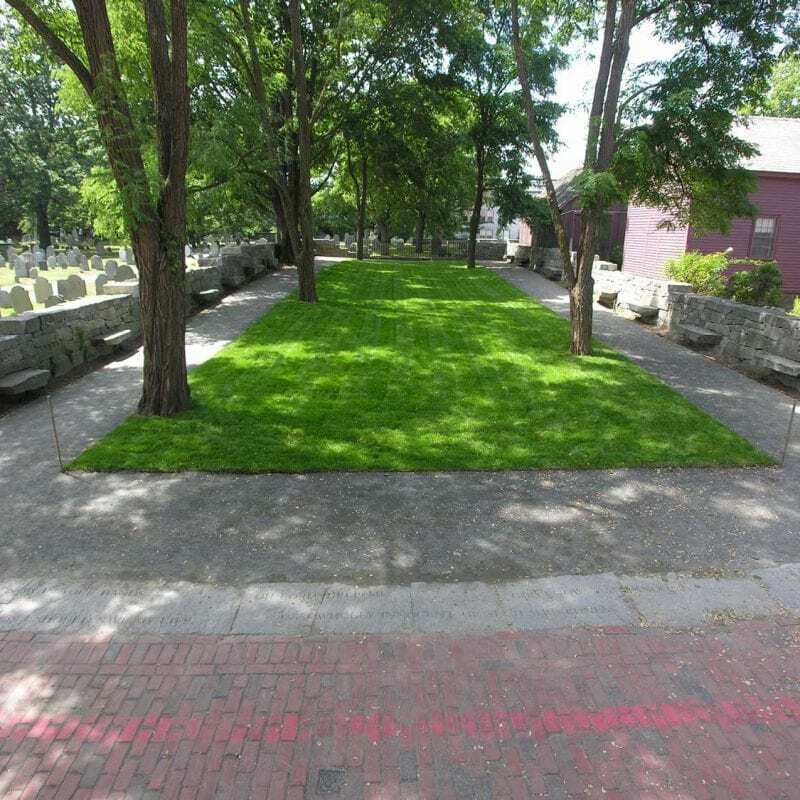 This quiet and peaceful memorial, located in the very center of Salem, provides a place for people to pay their respects, to reflect on tolerance and understanding, and to remember the inspiring stories of personal courage revealed in 1692.